“The Five Great Keys” will teach you the keys of C, A, G, E & D Major on your guitar. Learning the chords in these five keys has never been easier. 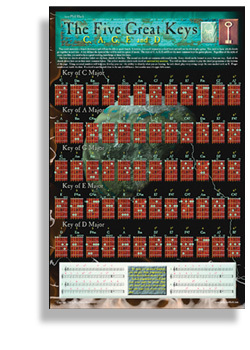 This graphically stimulating poster from Santorella Publications shows twelve chords in each of these keys by using chord box diagrams with suggested fingerings. Simply hang this poster in your music studio, practice room or even your bedroom wall. Any visible spot where “at-a-glance” help is all you need.